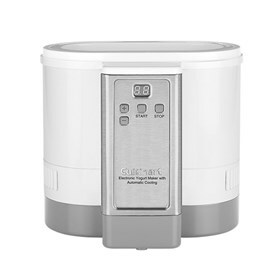 The Cuisinart CYM-100 is a electronic yogurt maker that features stainless steel styling for easy operation of yogurt making. It has built-in cooling system which automatically shifts to the perfect chilling temperature and allows to make more than six 8-ounce servings of yogurt at once. The yogurt maker has digital time display that clearly displays and counts down processing time. The Electronic Yogurt Maker With Automatic Cooling has many exciting features for users of all types. See the Electronic Yogurt Maker With Automatic Cooling gallery images above for more product views. The Electronic Yogurt Maker With Automatic Cooling is sold as a Brand New Unopened Item.